Looking for BUSINESS plans instead? XOOM Energy, LLC through its family of companies is a retail electricity, renewable and natural gas provider in over 90 deregulated markets across the U.S. XOOM Energy’s family of companies includes: "XOOM Energy California, LLC", "XOOM Energy Connecticut, LLC", "XOOM Energy Delaware, LLC", "XOOM Energy Washington D.C., LLC", "XOOM Energy Georgia, LLC", "XOOM Energy Illinois, LLC", "XOOM Energy Indiana, LLC", "XOOM Energy Kentucky, LLC", "XOOM Energy Maine, LLC", "XOOM Energy Maryland, LLC", "XOOM Energy Massachusetts, LLC", "XOOM Energy Michigan, LLC", "XOOM Energy New Hampshire, LLC", "XOOM Energy New Jersey, LLC", "XOOM Energy New York, LLC", "XOOM Energy Ohio, LLC", "XOOM Energy Pennsylvania, LLC", "XOOM Energy Rhode Island, LLC", "XOOM Energy Texas, LLC", and "XOOM Energy Virginia, LLC" (hereinafter collectively "XOOM Energy") and offers electricity, renewable and/or natural gas products in each of their respective states. We are not affiliated with, nor endorsed by, any local utility or state commission. Where does XOOM Energy offer service in the U.S.? XOOM Energy, LLC has wholly-owned subsidiaries offering natural gas and electricity service in 19 states, plus the District of Columbia, across the U.S. totaling 90+ utilities – making XOOM Energy, LLC one of the largest energy retailers in the country. Is my electricity or natural gas service ever at risk by enrolling with XOOM Energy? No. You are never at risk of not having service by enrolling with XOOM Energy. XOOM Energy is required to post collateral with each utility, and in the unlikely event XOOM Energy was not able to service your account, the utility would procure and deliver energy to your home or business on XOOM Energy's behalf. What is an energy supplier? An energy supplier is a company that acquires its electricity, renewable energy or natural gas supplies from the wholesale market and is licensed to sell it retail to homes and business. Wholesale energy supply sources include much of the same source that the utility will use, such as electricity generators or the open market. An energy supplier is not your local utility. The utility still operates the local distribution wires and pipes which carry electricity and natural gas through its territory and to homes or businesses. An energy supplier purchases and supplies energy, the local utility, delivers the energy to your home. What utilities does XOOM Energy service in Pennsylvania? Currently, XOOM Energy Pennsylvania, LLC supplies electricity and/or natural gas in: Duquesne Light, FirstEnergy-Met-Ed, FirstEnergy- Penelec, FirstEnergy- Penn Power, FirstEnergy- West Penn Power, PECO, PPL Electric Utilities, UGI Electric, Columbia Gas of Pennsylvania, Equitable Gas, National Fuel Gas Company-PA, Peoples Natural Gas of Pennsylvania, UGI Central, UGI South, and UGI North territories. Energy deregulation has been around for more than two decades in certain states and is designed to ensure consumers have access to adequate and competitively priced energy supplies. While your local utility is still responsible for maintaining the wires, pipes and infrastructure that make up the distribution system, reading your meter and responding to emergencies, the utility no longer holds a monopoly on the energy service. Customers have the ability to choose from multiple competitive retailers that offer various service plans at competing rates. Will I be switching utilities? No. Your local utility will remain the same and will continue to deliver energy to your home or business just like they did when you bought the energy supply from them. What is the history on variable rates in Pennsylvania? Will my service be interrupted when I switch service suppliers? No. You are never at risk for service disruptions for switching to XOOM Energy. In fact, you will see no difference in the service you are receiving. The only change will be in your billing. XOOM Energy will appear as a line item on your utility bill. All fees are outlined and explained in the Terms and Conditions that accompany each service plan. A fixed rate plan provides you with stability and peace of mind. A fixed rate product may be higher or lower than utility rates, but, unlike utility rates, a fixed rate product will not change during the life of your contract. You are protected against unexpected and costly price increases and have greater control over the cost of your energy. A variable rate plan allows you to purchase energy at market-based prices that change from month to month. While a variable rate is subject to monthly price increases or decreases, it may help you realize the lowest possible cost in the market. However, it also exposes you to possible price increases, and, unlike a fixed rate, a variable rate does not protect you against price volatility. This may be higher or lower than the utility rate. Why do I have to pay a cost recovery fee if I cancel? For XOOM Energy to offer and fulfill its term obligation to you, we have to purchase energy in advance of usage to cover the entire length of your contract. If you cancel your contract early, XOOM Energy needs to offset the cost of selling the unused portion of your energy to others. The cost recovery fee covers this cost and any other expenses we incur because of your cancellation. You will receive your bill directly from the utility. XOOM Energy supply charges will appear along with your utility service and delivery charges. Does XOOM Energy offer Budget Billing? The Budget Payment Plan is available on both the XOOM Energy and utility (Columbia Gas) portion of your charges. If you are currently enrolled on a Budget Payment Plan, you will remain on it after switching to XOOM Energy. If you are not enrolled on a Budget Payment Plan and would like to be, please contact Columbia Gas Customer Care at 888.460.4332. Budget Billing is available on both the XOOM Energy and utility (Duquesne) portion of your charges. If you are currently enrolled on a Budget Billing plan, you will remain on it after switching to XOOM Energy. If you are not enrolled in Budget Billing and would like to be, please contact Duquesne Customer Care at 888.393.7000. The Budget Plan is available on both the XOOM Energy and utility (National Fuel) portions of your charges. If you are currently enrolled on a Budget Plan, you will remain on it after switching to XOOM Energy. If you are not enrolled on a Budget Plan and would like to be, please contact National Fuel Customer Care at 800.444.3130. Budget Billing is available on both the XOOM Energy and utility (MetEd) portion of your charges. If you are currently enrolled on a Budget Billing plan, you will remain on it (after switching to XOOM Energy) for your utility (MetEd) charges, but you will need to contact XOOM Energy to ensure that your XOOM Energy charges are also put on Budget Billing. Budget Billing is available on both the XOOM Energy and utility (Penelec) portion of your charges. If you are currently enrolled on a Budget Billing plan, you will remain on it (after switching to XOOM Energy) for your utility (Penelec) charges, but you will need to contact XOOM Energy to ensure that your XOOM Energy charges are also put on Budget Billing. Budget Billing is available on both the XOOM Energy and utility (PECO) portion of your charges. If you are currently enrolled on a Budget Billing plan, you will remain on it after switching to XOOM Energy. If you are not enrolled in Budget Billing and would like to be, please contact PECO Customer Care at 800.841.4141 (Electric) or 800.841.4141 (Gas). Budget Billing is available on both the XOOM Energy and utility (Peoples) portion of your charges. After you switch to XOOM Energy, you will need to contact Peoples Customer Care to re-enroll on Budget Billing. If you are not enrolled in Budget Billing and would like to be, please contact Peoples Customer Care at 800.764.0111. Budget Billing is available on both the XOOM Energy and utility (PPL) portion of your charges. If you are currently enrolled on a Budget Billing plan, you will remain on it after switching to XOOM Energy. If you are not enrolled in Budget Billing and would like to be, please contact PPL Customer Care at 800.342.5775. Budget Billing is available on both the XOOM Energy and utility (Equitable-Peoples Gas) portion of your charges. After you switch to XOOM Energy, you will need to contact Equitable - Peoples Gas Customer Care to re-enroll on Budget Billing. If you are not enrolled in Budget Billing and would like to be, please contact Peoples Gas - Equitable Customer Care at 800.764.0111. FirstEnergy Penn Power (Budget Billing): Budget Billing is available on both the XOOM Energy and utility (Penn Power) portion of your charges. If you are currently enrolled on a Budget Billing plan, you will remain on it (after switching to XOOM Energy) for your utility (Penn Power) charges, but you will need to contact XOOM Energy to ensure that your XOOM Energy charges are also put on Budget Billing. Budget Billing is available with XOOM Energy. The charges will be identified as supplier charges on your utility bill. If you are currently enrolled on a Budget Billing plan, you will remain for utility charges once you enroll with XOOM Energy, but you will need to contact XOOM Energy Customer care at 888.997.8979. If you are with UGI Gas, please contact UGI Customer Care at 800.276.2722. It’s simple. If you are the account holder or legally authorized person on the account, you may enroll right here online. It only takes a few minutes – all you need is your utility bill to get started. What happens once I complete the enrollment process online? Once you complete the enrollment process online, you will receive a confirmation e-mail containing your confirmation number, the summary of your order and other information detailing your service with XOOM Energy. Once the utility accepts enrollment, your service will be switched to XOOM Energy. Can I upgrade to a different program? Some of XOOM Energy's service plan contracts, but not all, allow you to switch to another service plan contract within the term of the contract, so you need to read carefully and understand the service plan contract you select. Renewable energy is energy produced from sources that have less of a negative impact on the environment compared to fossil fuels. Green energy can supply a significant proportion of the country’s energy needs, which has many benefits such as, environmental improvement, an increase of fuel diversity and regional economic development. How do I know XOOM Energy is truly providing renewable energy? XOOM Energy provides consumers with renewable energy Information based on state law and regional fuel mix on our disclosure labels. Click on your individual renewable plan for more details. These disclosure labels are often limited to the system mix and for those enrolled in a renewable energy program, they may not include the additional, voluntary, renewable energy associated with your product. Renewable energy costs more than traditional energy due to limited resources and availability of renewable energy at this time. If you plan to move to an area where XOOM Energy offers service, simply contact your utility and they will establish service at your new address. Please note that you must stay with the utility for one billing cycle before you can switch back to a competitive supplier. Who does XOOM Energy purchase renewable energy from? To offer you competitive rates XOOM Energy purchases its renewable energy from various energy vendors. Can a customer switch from a Standard Product to a Renewable Energy Product? Yes, customers can switch from a standard variable plan to a fixed renewable product, if offered. How does XOOM Energy reduce my energy costs? XOOM Energy cannot guarantee savings because each of our service plans offers a unique value proposition. Fixed rate service plans are an excellent way to lock in your rate in for the long haul and avoid price fluctuations. Your pricing remains steady, providing you with consistency and peace of mind. Variable rate plans are based on market conditions and priced on a monthly basis. If you're not looking for a long-term contract and enjoy the flexibility of market-based rates, this is the service plan for you. What sets us apart from other energy suppliers? We offer innovative plans at competitive rates, combined with excellent customer service. We keep it simple and straightforward. This all adds up to a great value. How does XOOM Energy provide renewable energy above and beyond what is required by law? XOOM Energy purchases Renewable Energy Credits (RECs) on behalf of our voluntary green customers. An REC represents the property rights to the environmental, social, and other nonpower qualities of renewable electricity generation. RECs provide flexibility in procuring green power across a diverse geographical area and applying the renewable attributes to the electricity use at a facility of choice. This flexibility allows organizations to support renewable energy development and protect the environment when green power products are not locally available. RECs can be generated from a variety of renewable sources, including but not limited to solar, wind and hydro. 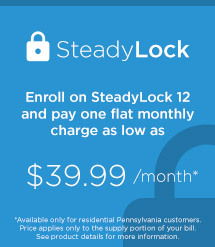 SteadyLock 12 is a 12-month long rate plan that offers our residential customers a flat monthly charge each month that is determined by your annual historical usage and premise type. With one flat monthly charge our customers can worry less about their energy costs and protect themselves from the month-to-month bill uncertainty. 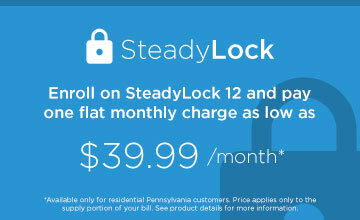 How is the SteadyLock 12 flat monthly charge determined? After the enrollment is submitted XOOM Energy will review your annual historical usage and premise type, as provided by your local utility, to determine which tier your account falls under. Each tier has a different priced flat monthly charge. *For more details visit xoomenergy.com/en/residential/pennsylvania. Not sure which plan is right for you? Ask an expert! In today’s fast-paced times, consumers are always looking for ways to simplify and put more certainty into their lives. Many service providers, such as internet and cell phone, offer set monthly pricing for easier predictability. High energy bills can leave customers frustrated, but thanks to the SteadyLock Plan, opening your monthly bill just got a lot less stressful! With SteadyLock, you pay one flat monthly charge for your energy supply*, giving you one less thing to worry about each month! Affordable electric plans designed to fit any lifestyle and make monthly energy budgeting easier. *You will pay a flat monthly charge, plus taxes and fees, for your electricity supply. The amount of your flat monthly charge will be determined by your annual historical usage as provided by your local utility and is set forth in the chart above. If your historical annual usage is over 29,999 kWh you will not be eligible for the plan. You will continue to be responsible for all charges assessed by your local utility for all delivery and other services it provides, including any other fees or taxes specifically associated with services it continues to provide during the term of your Agreement. Available only for residential Pennsylvania customers. Please see your Terms and Conditions for more details. How do these fees work? One year agreement required. Other taxes and fees may apply. If you cancel your service before the contract ends, a cost recovery fee of $110 may apply. Only the utility account holder or persons legally authorized on the account may enroll. If you are currently under a contract with a retail supplier, understand your obligations and rights before switching. With no long-term contracts or commitments, you're free to change your plan at your convenience. *This Promotional Offer is only available to new customers who have not been a XOOM Energy customer in the past 6 months and is intended for general use customers. The Introductory Offer is intended for customers on standard tariff rates and accounts on special utility tariffs rate such as street lighting, space heating rate or hourly pricing rate schedules are not eligible for this promotion. Your rate will be applied during your first 3 bill cycle(s). XOOM Energy may end this promotion at any time without notice. This rate may change in the subsequent months at the sole discretion of XOOM Energy. 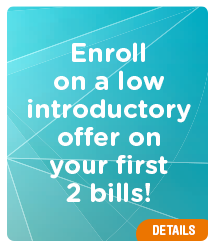 Promotional Offer: ENROLL TODAY AND GET A LOW INTRODUCTORY RATE ON YOUR FIRST 3 BILLS! * New customers only. With our variable rate SimpleFlex plan, get the flexibility you want! Rate above is only available to customers enrolling with XOOM Energy for the first time. Rate above applies to all kWhs used. After the promotional period, this rate may change in the subsequent months at the sole discretion of XOOM Energy. XOOM's charges will be reflected on the monthly bill you receive from the utility. Only the utility account holder or persons legally authorized on the account may enroll. If you are currently under a contract with a retail supplier, understand your obligations and rights before switching. Get the peace of mind you deserve with our RescueLock 12 fixed rate plan! • Protect yourself from the uncertainty that you've come to expect with energy bills. *This promotion is sponsored by XOOM Energy, LLC, including its wholly owned subsidiaries (collectively "XOOM Energy"), doing business at 11208 Statesville Road, Suite 200, Huntersville, North Carolina 28078. The proceeds from the promotion will benefit PetSmart Charities, Inc. (“Charities”). XOOM Energy will pay to Charities in the US for its general charitable purposes the equivalent of 5% of monthly energy charges paid by participating XOOM Energy customers. This contribution is not tax deductible. Charities is an organization described in Internal Revenue Code Section 501(c)(3). A copy of its most recent financial report is available by contacting the organization at 19601 North 27th Ave., Phoenix, AZ 85027, or by telephone at 1-800-423-7387. 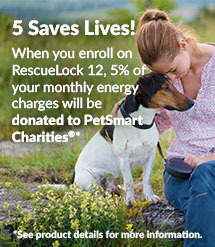 For more information, visit www.petsmartcharities.org. Registration by Charities or the Promoter with any state regulatory agency does not imply endorsement. Get the peace of mind you deserve with our SureLock 12 fixed rate plan! Rate above is available to customers enrolling with XOOM Energy for the first time. One year service agreement required. Other taxes and fees may apply. XOOM's charges will be reflected on the monthly bill you receive from the utility. If you cancel your service before the contract ends, a cost recovery fee of $110 may apply. If you are currently under a contract with another provider understand your obligations and rights before switching. Only the utility account holder or persons legally authorized on the account may enroll. With our fixed rate SimpleClean 12 Plan, lock in your green energy rate for 12 full months, guaranteed! This plan offers electricity price stability for the duration of your term, regardless of market conditions. With SimpleClean 12, you protect yourself from the uncertainty that comes with energy bills. Take the uncertainty out of your energy bills with our SureLock 36 fixed rate plan! Three year agreement required. Other taxes and fees may apply. XOOM's charges will be reflected on the monthly bill you receive from the utility. If you cancel your service before the contract ends, a cost recovery fee of $300 may apply. If you are currently under a contract with another provider understand your obligations and rights before switching. Only the utility account holder or persons legally authorized on the account may enroll. Do your part for the environment with these clean, green energy choices. With XOOM Energy’s Pre-Pay option you have the peace of mind knowing that you’re paying for your electricity without the hassle of a bill each month and the flexibility to pay as you go. Pennsylvanians know a thing or two about how to produce and use energy right. For competitive prices, be sure to exercise your right to choose between retail energy providers. 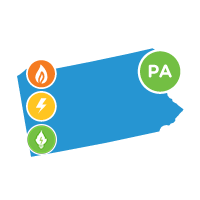 Compare XOOM Energy for options in energy rates and plans in Pennsylvania. Enjoy the flexibility of market-based prices and energy rates that vary month to month. With no long-term service agreements you're free to change your product or energy plan whenever you choose. Variable energy plans and the ability to choose a variable rate option means flexibility in you utility spend. Choose from a wide range of energy options in almost every market that XOOM Energy serves. When you have options for both home and commercial service, you get the specific rates, terms and renewable energy choices that are best for you. Do your part to promote a cleaner environment with SimpleClean, our renewable energy option for electricity services. When you choose SimpleClean, you can be sure that your energy is derived from natural, sustainable resources. XOOM Solar, LLC, headquartered in Huntersville, NC, provides a complete, customized solar solution for homeowners in the U.S.
Come visit our web site at XOOMSolar.com and learn more about our residential solar solutions. You can see how XOOM Solar can save you money by entering some brief information on your home and our solar advisers will take you through a one-on-one consultation helping you choose the solar system that optimizes your savings. You are in a dual commodity market and eligible to enroll on a Natural Gas plan. The utility selected requires a zip code to be entered. Let us know the zip code and utility that you are in and we’ll let you know once it’s added to our service area.